And, this afternoon, in the Wieden + Kennedy lobby, the tba institute kicked off with a lecture by Paul D. Miller, known to many as DJ Spooky that Subliminal Kid, who set the stage for his performances later tonight and tomorrow of Rebirth of a Nation, which takes D.W. Griffith's shamelessly racist 1915 film, Birth of a Nation as its starting point. Miller is a DJ, artists and writer equally fluent in the vocabulary of electronic music, philosophy, art history, cultural studies, 20th century composition and hip-hop. In his recently published book, Rhythm Science, Miller states that he began DJing as conceptual art. Miller is certainly one of the most articulate DJs around and his work fits as comfortably in a warehouse as in a museum (in fact Rebirth of a Nation was performed last year at Paula Cooper Gallery in NYC). DJ culture embodies a postmodern aesthetic and none of its potential as a medium for cultural commentary is lost on Miller. 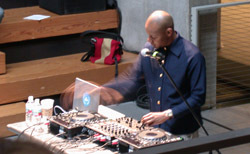 During the lecture, he parsed the way in which he conceptualizes DJ culture as art. For Miller, it's more than just sonic play, it's a form of sculpture. The DJ as sculptor borrows freely from a media-saturated culture of sound and image, what Miller refers to as "information ecology," implying the ways in which data gives way to meta data. The DJ is a sculptor of memory, and when constructing mixes for an audience, the DJ is playing with context as much (or perhaps more) than content. DJ culture lays bare the fluidity and unfixed nature of meaning, a demonstration of how meaning functions in a Structuralist sense. Miller's lecture was as fluid as his prose, freely folding in sound and image, explanation and demonstration. Complimenting his explanation of sampling as a sculpture of memory, audience members walked away with CDs, each with a slightly different mix burned straight from Miller's Powerbook, bringing in everything from 20th century composition (Monk, Glass, Reich) to traditional Gamelan to work by other contemporary DJs. Miller's work is as much about deconstructing as reconstructing and Rebirth of a Nation promises to confront these issues head-on, but of course, not without style or humor. See the performance of Rebirth of a Nation tonight and tomorrow. You can also catch him spinning around midnight at The Works late night tonight and tomorrow at PNCA for Saturday's noontime chat. Visit the tba website for details.